I am often asked how the idea of Cooper came about. Cooper’s roots began in one of the smallest restaurant/bars in Tokyo, Japan, with an accidental traveling companion that was in my backpack—a stuffed animal. While on my first trip to Asia, I stopped in Tokyo for three days to take in the sights. My travel guide mentioned a unique street area near Shinjuku Station where there we’re a multitude of places to grab a beverage. These places were so small that upon entering, the place would become your own and they would simply close the door to new patrons. From my perspective, I thought this would be a great way to practice my marginal Japanese language skills and potentially learn some new words and correct pronunciation. A Japanese language instructor for free, if you will. After sitting for a minute, it became painfully apparent the person behind the counter didn’t speak any English. Moreover, it turns out my Japanese was completely miserable and they couldn’t understand my attempts. Because we were already sitting down, I simply pointed at something behind the counter and they brought one. After a few more tries at speaking and pointing to my travel guide, we just sat staring and smiling. While clearing out my backpack from the day’s travels, I brought out a little stuffed animal (the original L.L. from our London book) and placed him on the counter, next to my travel guide,. A little more time passed. Finally, the counterperson “asked” to see my character and proceeded to make him dance on the counter. I ended up doing my first “Cooper” photo shoot that evening staring a Little Lamb and an unnamed Japanese waitperson, along with a bunch of smiles and laughs to last a lifetime. Regardless of our ability to speak English or Japanese to each other, the little stuffed animal broke through and made for a memorable time. On the next leg of my journey, I was in Koh Samui, Thailand on an isolated beach sitting in the sand. A coconut shell floated nearby and I grabbed it with an idea. I ended up placing L.L. in the half-shell and took some amazing pictures of him floating in the Gulf of Thailand as the sun was going down. Now I had two unique stories (with documentation) of a trip that no one on earth had ever done. It wasn’t until two months later after a trip to New York City that I really started thinking about the idea of taking stuffed animals and feature them traveling around the world. I sat on my deck one Sunday afternoon and literally wrote out the entire first edition New York City book in 2 hours, with graphics, text, logo and style. I proceeded to share the idea with my business partner, Martin McCann, and he decided he was “in”. We were going into the publishing business. NOTE: If you enjoy Cooper, please share it with someone. We’re trying to grow what we think is a great brand, filled with fun, education, adventure and a bit of silliness. 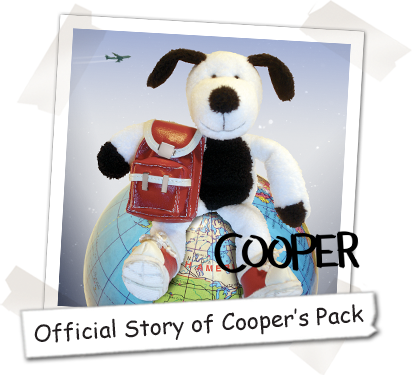 Cooper isn’t produced by a big corporation but rather two individuals from Seattle, Washington who are committed to bringing the world of travel and fun to kids (and adults) everywhere.